Scientists at UC San Francisco are reporting that they have found a way to reverse some of the negative effects of aging on the brain, using a video game designed to improve cognitive control. The findings, published this week in Nature, show how a specially designed 3-D video game can improve cognitive performance in healthy older adults. The researchers said it provides a measure of scientific support to the burgeoning field of brain fitness, which has been criticized for lacking evidence that such training can induce lasting and meaningful changes. In the game, which was developed by the UCSF researchers, participants race a car around a winding track while a variety of road signs pop up. Drivers are instructed to keep an eye out for a specific type of sign, while ignoring all the rest, and to press a button whenever that particular sign appears. The need to switch rapidly from driving to responding to the signs - i.e. multitasking - generates interference in the brain that undermines performance. The researchers found that this interference increases dramatically across the adult lifespan. But after receiving just 12 hours of training on the game, spread over a month, the 60- to 85-year-old study participants improved their performance until it surpassed that of 20-somethings who played the game for the first time. The training also improved the participants' performance in two other important cognitive areas: working memory and sustained attention. And participants maintained their skills at the video games six months after the training had ended. "The finding is a powerful example of how plastic the older brain is," said Adam Gazzaley, MD, PhD, UCSF associate professor of neurology, physiology and psychiatry and director of the Neuroscience Imaging Center. Gazzaley co-founded the company, Akili Interactive Labs, which is developing the next generation of the video game. Gazzaley, who has made a career out of studying how distraction affects cognitive performance, said his game, NeuroRacer, does more than any ordinary game - be it bridge, a crossword puzzle, or an off-the-shelf video game - to condition the brain. Like a good teacher, he said, NeuroRacer undermines people's natural tendency to go on automatic pilot once they've mastered a skill, and pushes them further than they think they can go. "Normally, when you get better at something, it gets easier," he said. But with this game, "when you get better, it gets harder." Evidence that the adult brain is capable of learning has been accumulating for more than a dozen years. A study of London taxi drivers, for example, found that their brains had changed as they learned to navigate the city's notoriously complicated streets. Nevertheless, Gazzaley said the brain's function often erodes steadily over time in many areas, with some exceptions, like wisdom. Given this, Gazzaley said it's encouraging that even a small amount of brain training can reverse some of the age-related decline. Gazzaley's group found evidence of a possible brain mechanism that may explain the improvements he saw in his older subjects, and why these gains transferred to other cognitive areas. Electroencephalograph (EEG) recordings point to changes in a neural network involved in cognitive control, which is necessary to pursue goals. The scientists measured midline frontal theta - or low frequency oscillations - in the prefrontal cortex, as well as the coherence in these waves between frontal and posterior regions of the brain. As the older "drivers" became more adept at the multitasking challenges of NeuroRacer, their brains modulated this key neural network and its activity began to resemble that of young adults. Both of these measures -midline frontal theta and theta coherence - are well established neural markers of cognitive control that have been associated with many of the processes that enable people to pursue their goals. "We see this as evidence that the training may have improved our study participants' ability to stay in an engaged, active state for a longer period of time," said Joaquin A. Anguera, the paper's first author and a post-doc in Gazzaley's lab. Indeed, the researchers found that the training-induced changes in this neural network predicted how well participants would do on a different test, called the Test of Variables of Attention (TOVA), which measures sustained attention. "The amount that midline frontal theta went up was related to something that was untrained, this other measure, the TOVA," Anguera said. "It implies there's something that changed that was common to the training and to the task we tested afterwards." Gazzaley said these findings point toward a common neural basis of cognitive control that is enhanced by the challenging and high-interference conditions of the video game, and this might explain how racing a car in 3-D could improve something as seemingly unrelated as memory. If the finding holds, it could have wide application. Other brain disorders like ADHD, depression and dementia are also associated with deficits in cognitive control. "Follow up studies using functional Magnetic Resonance Imaging and transcranial electrical stimulation are still needed to better understand exactly how this network is involved in the performance changes," Gazzaley said. 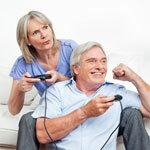 Other authors of the article, "Video game training enhances cognitive control in older adults," include Jacqueline Boccanfuso, Jean Rintoul, Omar Al-Hashimi, Farshid Faraji, Jacki Janowich, Erwin Kong, Yudy Larraburo, Cammie Rolle and Eric Johnston. Gazzaley is co-founder and chief science advisor of Akili Interactive Labs, which is developing cognitive video game software as diagnostic and therapeutic tools, and has a patent pending on a game-based cognitive intervention he developed from the research presented in the paper.